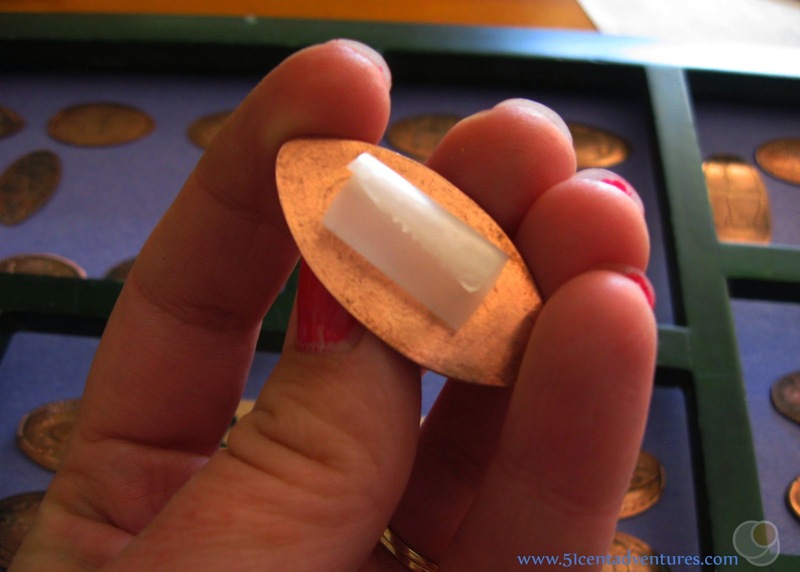 I named this blog after the cost of a pressed penny - 51 cents. A penny and two quarters are all I need to spend to get one of the best souvenirs. 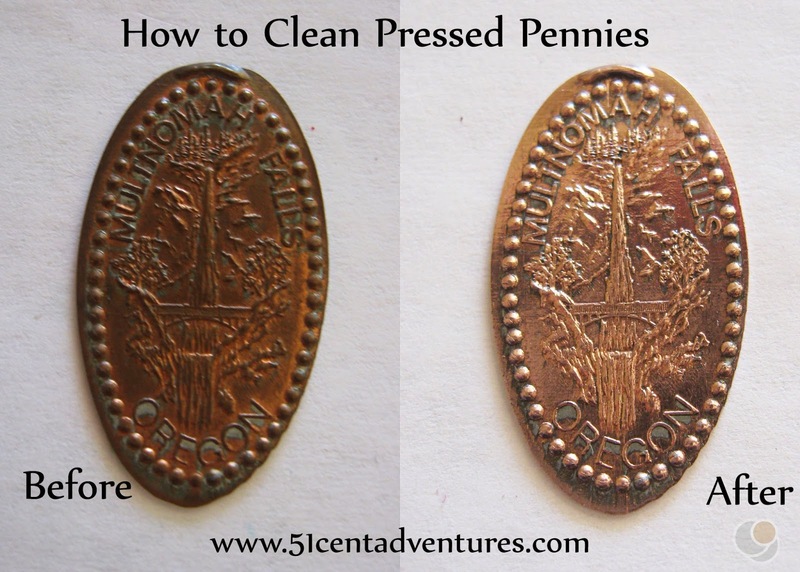 I love pressed pennies because even though they are inexpensive they have the name of the place you visited along with a picture of what makes it special. Trust me, nothing else in a gift shop is close to being this economical. I also like that the pennies are small and flat. I don't have to worry about where they are going to fit during my trip, and they wont add unnecessary clutter to my house when I get home. My penny collecting tradition started along with my road trip tradition. Back in May of 2008 Brandon and I took our first road trip to celebrate our first wedding anniversary. 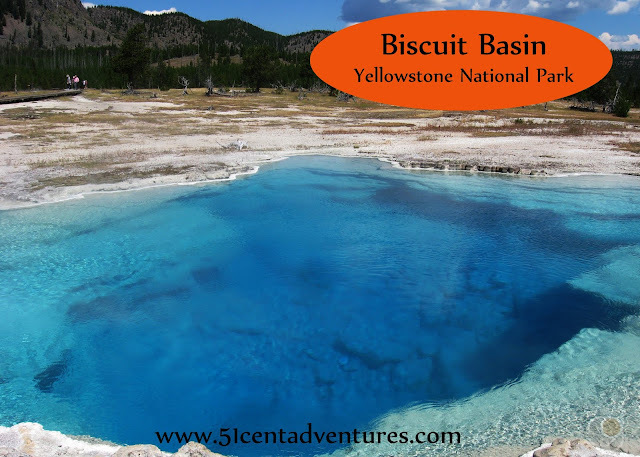 We picked Yellowstone National Park as our destination and headed up there for four days of fun. During our vacation we stopped at the gift shop inside the Old Faithful Lodge. We bought a DVD with information about the park for $20, and two T-shirts for about $12 each. On a whim, I pressed a penny at the souvenir penny machine. As we walked back to our jeep I was holding the bag with the DVD and T-shirts in one hand and the penny in the other. I kept admiring the image of Old Faithful that was pressed into the penny's shiny face. 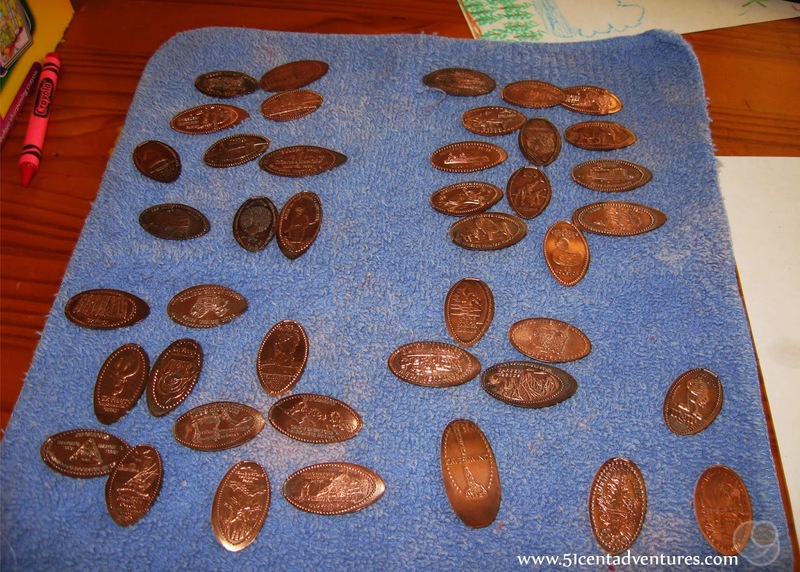 My husband commented, "Only you would spend over $40 on souvenirs, and be more excited about a penny!" We both laughed. After that we hardly ever bothered to buy big or expensive souvenirs on our vacations. Most of the time we were doing things so cheaply we didn't have extra money for trinkets anyway. But no matter what, we always stopped at every penny presser machine that we saw. Gift shops sell books that you can put your pennies into, but I don't like the idea of keeping something I like so much in something that I can't see. I believe in decorating my home with things that I love. 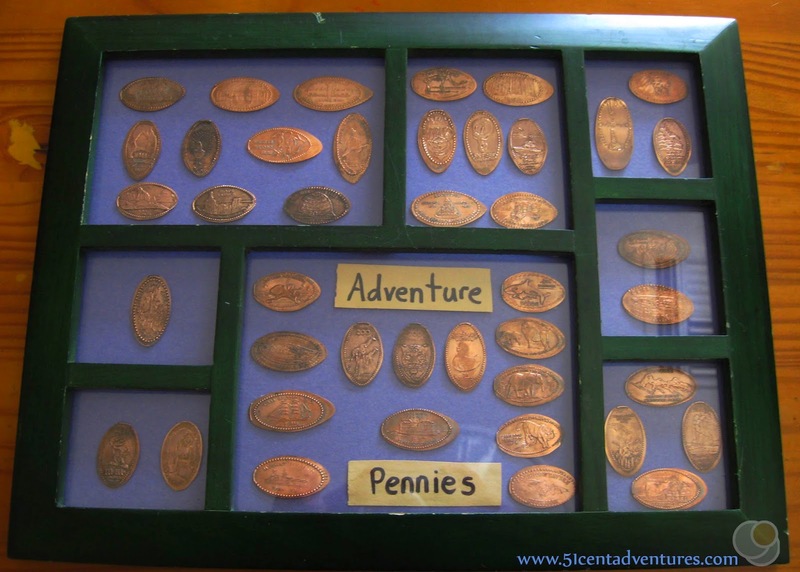 So I've been putting my pressed pennies on display in a picture frame for years. Recently I acquired a few more pennies which meant my collection outgrew it's current frame. 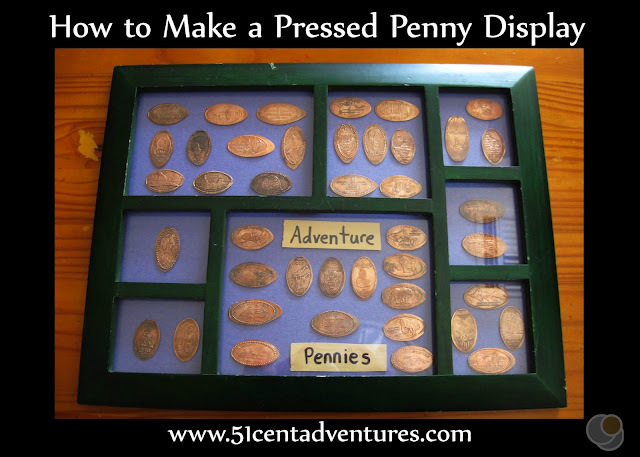 I decided to move it over to a new frame, and take pictures along the way to show you how to put your own pressed pennies on display. Here's the tutorial for you. I started by taking all the pennies out of my old display. I'm kind of surprised by how many pennies I have accumulated over the years. My first picture frame only had four pennies in it. Now I have ten times that many. And I'm not anywhere near done. My family is moving to Alabama in the next few months, and with that move will come many more pennies. I decided to clean my pennies. I've never done this before, though I probably should have. Even though I love pressing pennies I'm never really prepared when I find a pressing machine. Brandon and I always seem to be scrounging around in the car's cup holders to find two quarters and a penny. Usually we are happy to find a penny at all - let alone a shiny one. So even some of our most recently pressed pennies started out pretty tarnished. I assumed that I would use some Tarnex that we recently bought, but Brandon told me to use vinegar and salt. It was a combination he remembered reading about in a book of simple science experiments. Pinterest confirmed his memory and gave me the quantities I should use. I used 1 tablespoon of salt and a half cup of vinegar. 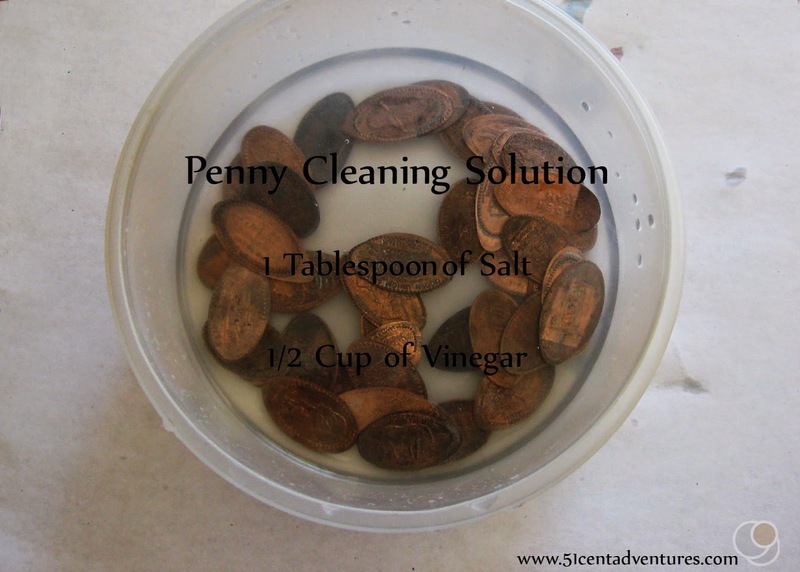 The cleaning solution started working almost as soon as I put the pennies inside. I used a soft rag to rub the tarnish off of each penny. Then I rinsed them off with water. (If you don't rinse them the tarnish will come back in a few days.) I was impressed by how well the copper shined up. This is the oldest penny in my collection. It was from Brandon's trip to Multnomah Falls, Oregon back in 1994. It was one of the more tarnished pennies, and was so dark that I could hardly tell what the picture was. The cleaning solution took most of the tarnish off. Most of the newer pennies shined up even better. I sorted the pennies as I cleaned them. I'm kind of OCD so I like to group them by state. One of my rules for doing a craft project is to start with the frame. It can be really frustrating to make a beautiful piece of art, but then have it not fit in a frame. So I always make sure I have a frame before I start any project. I used a frame that I picked up at a thrift store for less than $2. Since I know that this collection will out grow the frame within the next few months I didn't bother painting the frame. If I had painted it I would have used either black or orange paint. I made a background by tracing the back of the frame onto a Cheerios box. I cut that out and then glued construction paper to it. 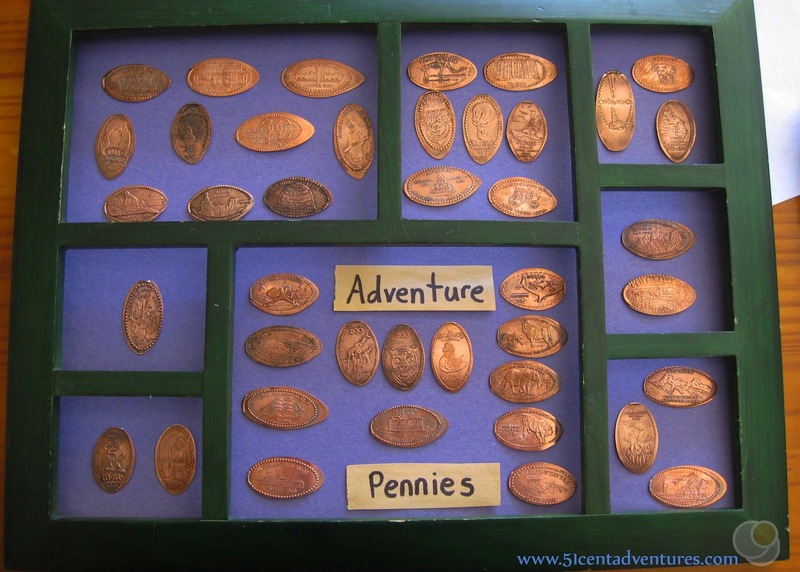 I've always displayed the pennies on a tan background that had little leaf designs on it. But this time I liked how the blue cloth that I dried the pennies on contrasted with the pennies. So I decided to use blue construction paper as the background in the display. I've learned from prior experience that the easiest way to make sure everything is visible in a frame is to take the glass out of the frame. I set the glass aside and put the frame over the background. Then I could put the pennies exactly where I wanted them without worrying that the edge of the frame would cover them. After I figured out where I wanted to put the pennies I secured them to the background. I just made a little roll with scotch tape so the tape will stick to the penny and to the paper. You could probably also do this with double sided tape. I don't recommend using glue. If you ever decided to rearrange your display you'd have a harder time removing the pennies from the background if they were glued down. After all the pennies are secured you can put the glass back in the frame. Put your display inside and voila - you have an amazing piece of art that will remind you of all the fun trips you have been on. 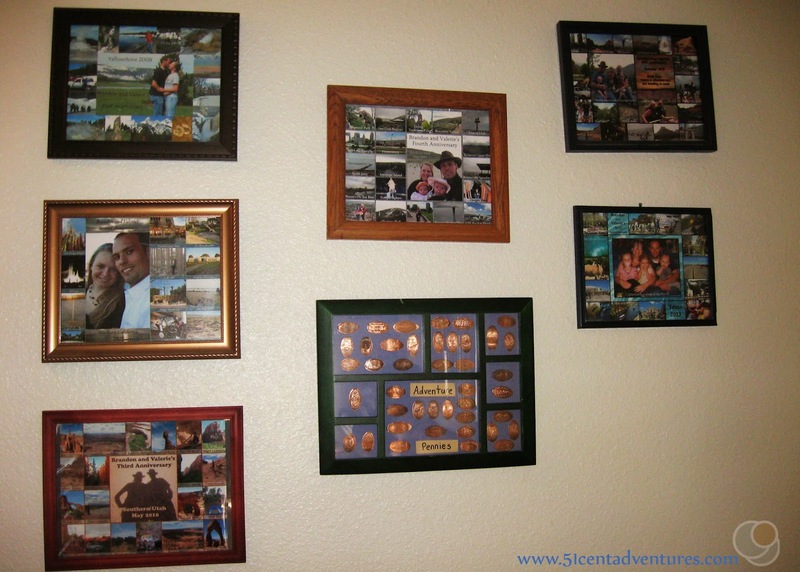 I display my pressed pennies on the wall along with the picture montages of all our road trips. Everything on this wall is a conversation piece, but the pennies are what people notice first. I hope this inspired you to display your own pressed pennies. If you are looking for ideas for your next road trip check out my other posts. 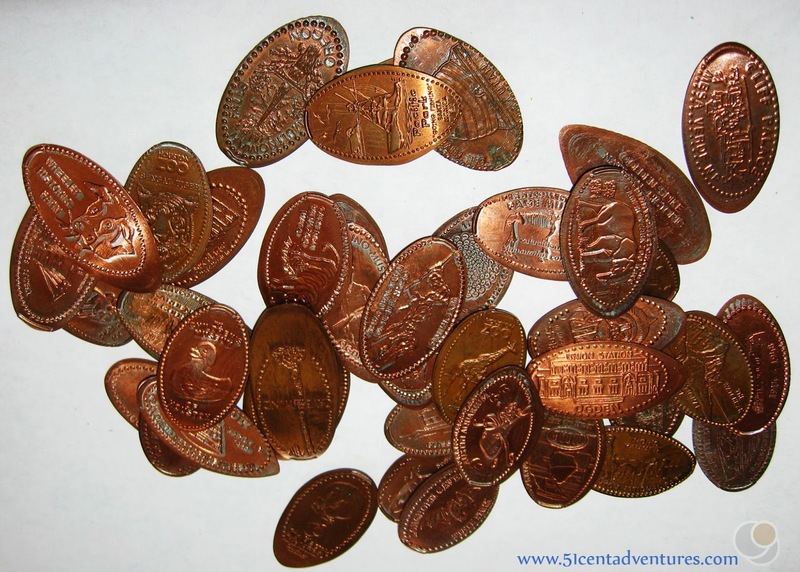 I can't guarantee that you'll find a penny pressing machine, but you'll make some great memories. I love how you display your pennies. I got my first pressed penny in San Francisco in the late 70's. My dad saw a man pressing them with a hand crank and took me over. Now my kids get them everywhere. We have books for them now I really want to do this.